I took a class many months ago called “Renewal in Christ.” It’s funny, when I heard about it there was this little indignant voice in my head that said, “There is NO WAY I’m gonna go to THAT! I don’t need RENEWAL in Christ… I’m just fine the way I AM!” But, low and behold, there I sat with a good friend of mine for a weekend dubbed, “Renewal in Christ.” It was one of the best uses of my time ever!!! And it just confirmed that anytime that little voice in my head says, “I don’t need this!! !” I should immediately sign up for whatever it is. “Renewal in Christ” basically gave me some tools to use in my prayer life. Some of them I had already known about and some of them were brand new to me. One of the warnings at the end was that since I had taken the steps to improve my connection with God I might expect that the devil would be waiting in the wings to tempt me away from God and make my prayer life challenging for a time. I have to admit, that came to fruition. I can’t put my finger on exactly what it was… but I had an extremely difficult time praying for months after the class. It was difficult to even string a sentence together towards God… so difficult that I would just settle on saying, “I’m sorry God… I’m trying.” I tried several different techniques but none of them worked. I was all over the place, couldn’t concentrate… and left a lot of my prayers to be said on my behalf by people I love (by the way… that works too. If you find you are unable… others CAN help and the Spirit is always there ready and willing to intercede on your behalf). One day I broke down when talking with a therapist. I told him I hadn’t been able to pray in a long time and that it was really bothering me. He told me to just keep trying, that was all God wanted. So, that’s what I did. About a month ago, I had a breakthrough in my prayer life after finally doing something I think God had been wanting me to do for months… nail down my priorities! I got a huge piece of butcher paper, a ruler and some magic markers and created a month schedule. My priorities came into focus as I filled in the minutes of the days. I scheduled a 30 minute prayer time for myself everyday! It’s funny, once the schedule was complete… my prayers just came easy as pie. I haven’t missed a day yet and they flow easily – I end up going over my 30 minutes without even realizing it. As a result, my daily conscious connection to God is so much better! I decided to take the plunge and plan a longer prayer time… the pastor who taught “Renewal in Christ” suggested baby steps in this… to go from a portion of your day to maybe a day and then a weekend and then perhaps even up to a week. I asked my husband if he would be cool with me a taking a weekend away from it all to just be with myself and connect with God. Thankfully, he was fully supportive so I made my reservation at a local resort. I didn’t know what to expect at all. There is the part of me that is very fearful of new situations and places. I wasn’t sure if I would be petrified and just stay in my hotel room alone all weekend… or if I’d be able to venture out a bit. 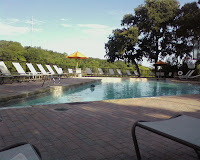 The place I stayed had 40 acres, a beautiful lake and both indoor and outdoor pool and hot tubs. It was gorgeous! It felt strange at first, my heart felt kind of hardened. A friend let me borrow a prayer book/meditation called “With Open Hands” I pulled it out of my bag as I unpacked. I was feeling strange so I decided to go for a walk around the grounds to find where everything was. Should I eat, where should I eat? Should I go swimming, which pool? Should I take a walk, which trail? Should I watch TV? The only thing on was Criminal Minds and that really wasn’t what I had in mind for a prayer retreat! It didn’t take long before I was sitting in my room feeling strange again, so I went ahead and sat down to read through the first chapter of the prayer book. Funny… it was about silence. The meditation was “Why do I avoid silence?” If that didn’t hit the nail on the head for why I felt strange… I don’t know what would have. My life is SO noisy… cell phones, television, a 4 year old constantly needing something, a dog who barks about everything, the radio in the car... silence just doesn’t happen unless I make it happen. This was my chance to really make it happen… I embraced it and allowed the strangeness to slide away. I laid down in the dark and silent room and meditated for a long while then decided to just drift off to sleep. The morning was glorious! I felt brand new!!! I felt happy and restored!!! 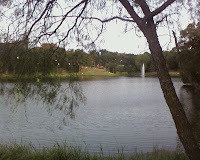 I dec ided to get some coffee and take a walk around the lake (2 mile walk). I wasn’t nervous about being alone, I was just satisfied in full. I heard nature and my own breath. I heard the ground crunching under my shoes and I knew that it was all because of God’s grace that I was there, enjoying His world. After my walk, I sat at a picnic table to read some of the prayer book. It was about depending on God. I had this realization… God doesn’t use the gifts He gives us to manipulate us… humans do that. God gives us gifts and asks nothing in return. Wow… once again I am astounded by the way I incorrectly label God with human characteristics! Then it came to me… I am afraid to depend on God fully because I fear He will ask me to do something I don’t think I am able to do, something outside of my current skill set. I fear failure so I want to just continue doing the things I already know how to do. My head knows God will never ask for anything He won’t give me the ability and support to do but it comes down to heart. I must decide to trust fully and open up and accept that He will not let go of me. I found myself able to do something I hadn’t been able to do in a long time… just be fully kind with no expectations. I was wearing a smile… and saying hello to everyone around me. It was like the piece of Jesus that once resided in me was back!!! My retreat had already accomplished something amazing, I could end it now and be elated. I think it’s only fair to say, that the kind part of me that seemed to be missing hadn’t really gone anywhere… it had just gotten crusted over with some hardening. Life does that to us sometimes. That’s why we all need retreats. I went to the pool. I was the only one there and it was cool, only because of how early it w as. I took a refreshing swim then sat down to complete another task God asked of me a week earlier. I had been upset with myself, and praying about how easily someone (of influence) in my life had gotten me confused about aspects of my Christianity. God suggested that I write down in plain and simple terms what it is I believe and why. That way it would be right there in black and white. It would be real and concrete… confusion would have no choice but to flee. I sat there at the pool going through my Bible… I read through all four Gospels and came up with my list… and linked them each to various places in the Bible. I’m not sure my list is complete but… wow, I have a much better understanding of what I stand firm on. One of the things I wrote down was “Always love” and another was “Always forgive.” I opened a different book to read a chapter which ironically told me I needed to do some major forgiveness. I went to my room and completed the suggested exercise of talking it out with an empty chair. I’m sure I looked like a nutbag but I didn’t care. I came to the conclusion; I had to forgive this person… so I could be forgiven by God, so I could stop hurting myself and because I knew I was bound to sin again in this lifetime. Forgiveness was a must. I went to my knees and made it real. 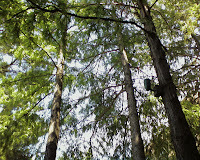 I took another walk later… found a cozy little corner outside with tall pine trees and a comf y wooden reclining chair. The prayer book talked about different types of prayer… prayers of petition, prayers of praise and prayers of thanksgiving… but the real distinction to concern myself with was… were my prayers considered prayers of little faith (I’ll pray for this even though I don’t think it will happen – what could it hurt???) or prayers of hope (I know God will answer me, I know God’s will will be done!)??? I have to say in searching my heart… I discovered that my prayers are full of hope. They didn’t used to be… but they are now. I pray with certainty that God will take care of me and others. I recognize that He will not always answer them with what I want but He will always answer in time. The Bible tells us that if we believe, God will give us whatever we pray for… but it also tells us that if we believe, God will show us what to pray for. I smiled at the thought that I was doing this hope thing pretty well. I was thankful! I was exhausted so I took a nap… ahhh. This is kind of funny, I used to love romantic movies until I realized how harmful they we re to me. I just latched on to the idea of that perfect never-ending love and really believed “movie love” was possible! When I got sober and checked into reality, I found that I really disliked those movies and was angry at myself for allowing myself to be so misled by them. Here’s the funny part… for some strange reason… I had really been wanting to re-watch the movie Titanic lately. The first time I watched it the love story made me fall head-over-heels for Leonardo! Here’s the really funny part… I was flipping channels on the television and there it was. And imagine my luck, it had just started! I sat watching it with a smile, enjoying it but not for the same reason I loved it the first time. I wasn’t quite sure why I was enjoying it. Half way through, I felt the urge to go outside for another walk and meditation time so I did. I returned in time to watch the last 45 minutes of the movie (wow - that’s a long movie). At the end, when Jack was making Rose promise to go on with her life and never give up, I started to cry. I’m not typically a crier so it surprised me especially since I wasn’t so involved with the characters… I asked myself why I was crying. That’s when I realized why I was enjoying this movie so much… and why I was emotional. In my mind, the movie related to what Jesus has done for me. He saved me… in every way I could ever be saved. He did it in love. He did it for free. He died for me. He asked me to make a promise to him… to never give up. I know, it’s silly to relate a pop culture movie to the reality of the great Jesus Christ, but it really struck me in those moments. I set my clock to watch the sunrise. I had the coffee maker ready and the lounging ch air in place. 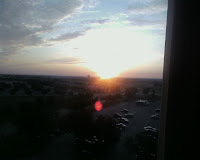 I sat perched in my chair at 5:15 am knowing the sun wouldn’t be up for quite some time. I sat there sipping coffee and praying for the people driving by. I watched the moon and stars slowly slide to the west across my window until they were out of view. It was so quiet. The sun peeked over the horizon at 6:30ish and it was beautiful. I’m not sure I ever remember watching a sunrise before. I decided to take another 2 mile walk around the lake before it got too hot. I got my coffee and strawberries and headed that way. But the feeling I had on this morning was much different than the feeling I had the prior morning. Instead of peace and serenity, I was struck with pure fear. Anxiety began to rise in me, almost uncontrollably. I wondered if I should not go for this walk all alone. I wondered if some danger awaited me out there that might leave my husband and child wondering what happened to me years later. Panic invaded my mind, body and heart. I prayed asking God if I should take this walk. He said yes. So I stepped forward to do it, in fear. As I walked, I told God over and over that I trusted He would take care of me, but admitted I was still afraid. For some reason I could not escape the fear. My head turned at every little noise. I kept telling God I trusted Him…I kept telling God I was afraid. I wondered why I was so scared. I made it all the way around without incident then sat down on the picnic table ready to read another part of the prayer book. Imagine my surprise to discover a lesson on courage awaiting me in the book. Part of following God’s will is having great courage in the face of fear. I learned that being afraid is okay sometimes… and it doesn’t mean we don’t have faith, it simply means we are human. I recall a well-meaning organization telling me that faith and fear can not be present at the same time. I guess I bought into that and since then have thought that if I truly had faith, I would never be afraid. My walk of terror showed me that, for me, that simply wasn’t true. Oh how I understood why I had been so afraid… God was teaching me a personal lesson, a lesson I will not soon forget. After another early morning dip in an isolated pool, I sat back and read a final lesson. It was a big idea… the idea of how our lives can actually become prayer instead of our lives just including prayer. What if everything we did we were able to have an awareness of God’s hand? What if everything we saw made us realize how powerful and present our Lord is? What if we were to regard every single person we came across as a real brother or sister in Christ? What if our lives were a living prayer to the Creator? I left the hotel feeling a mix between excitement to get home to my loving husband and adorable son and reluctance to re-enter my noisy, busy life. Funny, both excitement and reluctance at the same time. If I’m going to be honest, I have to admit I have those same feelings about God at times too. Interesting how doing the things we know are good for us incites such confliction. I, for one, will make a habit of taking my retreat time, my quiet time with God… little bits daily but also bigger weekend renewals as needed. Like I said, I feel like I got a little Jesus shaped piece of myself back… but all I really did was let God work a miracle, softening a slightly hardened heart. I had a true renewal in Christ experience and I highly recommend it! I heard an amazing sermon message at Saturday night service this week and I just HAD to write about it. The idea of what I am going to share with you is not my own, but these are my experiences and my interpretation of what the pastor shared with the congregation. I have to say a light bulb went off for me… and I am so very grateful. I had a loving family growing up, but I have stilled lived the majority of my life as though I were an orphan. In many ways I orphaned myself; it was not necessarily done for me. No matter what I did or where I went, I simply didn’t feel like I fit in. I jumped from school to school, friend to friend, job to job, relationship to relationship, place to place trying to find the place I truly belonged. I made a willful decision to leave college and my family in the United States to follow a boy to another country. I was never more orphaned than at that point in my life… I had no one. The boy I left it all for turned out to be… just a human being, flawed and orphaned himself. I expected a lot more and ended up extremely hurt. Years later, my self-imposed orphan status led me to alcoholism. I had been silently crying out to the world, “Someone… please… adopt me… I need to be loved… I want to belong… I want a daddy who accepts me just the way I am.” McGlynn’s Pub became my “daddy” for a few years. I went there every night drinking with strangers who soon became my family. No matter what I did, I was accepted. They knew my name, they knew my drink and they saved my bar stool for me. I felt loved. Getting sober made my “family” and acceptance disappear. I found a new family at AA. That worked for awhile but soon I had to face reality… I was still an orphan in my mind. Last night as I listened to the message I realized a part of that orphan still lives inside of me… I am unable to commit to a church family. I’ve told myself that it’s because I want to have the freedom to go where I wish, that I can’t choose between the two worship styles my husband and I disagree on, that churches are too eager to have you join and it is a turn off but I think the truth of the matter is… I still see myself as an orphan and I am afraid. Admitting this makes me tear up. I’m a mother. It’s a job I take very seriously. I attend a Christian parenting class once a week in an effort to do it right. One of the things I have learned in class is the importance of letting my son know that no matter what happens, no matter what he does, even when I’m angry or disappointed with him that I still love him. He must know beyond a shadow of a doubt that I love him unconditionally. Now this doesn’t mean he can walk all over me, it just means that hopefully he will sleep soundly at night with the knowledge that he is truly loved by his mother. Perhaps it is a generational thing, but this concept seems to be quite different from the way a lot of people my age were raised. Now, let me say this clearly… I am not blaming my parents or saying they did anything wrong in what I am about to say. I grew up thinking that love hinged on my good deeds. Somehow I ended up with this perception that the only time I was loved was when I had done something to make me worthy of love. On the flip side, when people were upset with me, I truly believed I was hated… yes, hated. I have many friends that grew up feeling the same way so, like I said, perhaps it was a generational thing… and as a result of these perceptions, I essentially became a slave for love. I have spent my life working diligently at earning the love of others. To this very day, I do not handle conflict very well. While my head now understands that real love doesn’t work that way, my habits and heart are easily led astray. I find myself working for love in almost every aspect of my life. The biggest aspect this affects is my relationship with God. I realized last night that I am continuing to diligently attempt to earn the love of my Father with everything I do. Yes, when I become still or even step backwards slightly my flesh begins to panic, afraid that the favor that God has rested on me will be ripped away and given to someone else who is more deserving. The devil is readily waiting at my ear, whispering confirmations of this incorrect belief. I have believed satan for far too long. It’s time to change. It’s time to step into God’s grace and believe with all I have, with total faith that I am truly loved regardless! I must accept that I am spoken for because I believe… that I am truly His daughter. Typing this makes me tear up for a different reason. A daughter of the King was created to enjoy all the kingdom has to offer. She was not created to be alone or to be enslaved. She is lovingly disciplined when she screws up, but never punished. She is fully aware of the responsibilities she has to be the best daughter she can be but she also knows beyond a shadow of a doubt that her Father’s love is not dependant on her performance. She is fully and awesomely aware of His grace. She is conscious of His presence and knows she is never alone. She is not an orphan, nor is she a slave… she is a rightful heir. She is confident… she accepts her family responsibility proudly and wears her families crest with honor never doubting where she belongs. How does she do this? She answers two questions honestly. I have asked them of myself: What do I know to be true about God? He loves me. What do I know to be true about me? I believe He sent His son Jesus to die for me. Today I start a new life. It isn’t the life of a lonely, confused and frightened orphan and it’s not the life of a workaholic, worried slave… but it is the life of a confident, responsible and humble daughter. An heir to the eternal kingdom of heaven! It’s only by grace that I understand this… and I am in fact… overwhelmed by grace. This changes everything.